Includes two MC-1 coils, ignition wires and instruction manual. Click here for additional information about the CD-L2 ignition. Ignition ships pre-programmed. Includes MC-1 coil, ignition wires and instruction manual. Click here for additional information about the CD-L2 ignition. Ignition ships pre-programmed. Includes MC-2 coil with mount hardware, ignition wires and instruction manual. Click here for additional information about the CD-L2 ignition. Ignition ships pre-programmed. The MC-1 miniature coil is a small single core single tower coil that can be easily daisy chained (multiple coils can be wired to fire off the same control signal). A single coil is used on one cylinder engines. Two coils may also be used with non-symetrical cylinder angles (one coil core per cylinder) on two cylinder engines, for example when single firing a Harley-Davidson motorcycle. Three or four coils can also be used on three and four cylinder engines. One coil per cylinder is required. Coil uses one 90° plug boot. The MC-2 miniature coil is a small single core dual tower coil that can be easily daisy chained (multiple coils can be wired to fire off the same control signal). This coil is used to waste spark engines with symetricaal cylinder angles (45°, 90°, 120° or 180°) or when dual firing Harley-Havidson motorcycles. One coil for every two cylinders is required. Coil uses two 90° plug boots. The VS-1 coil is a single core single tower coil that can be easily daisy chained (multiple coils can be wired to fire off the same control signal). A single coil is used on one cylinder engines. Two coils are typically used on two cylinder engines with non-symmetrical cylinder angles (one coil core per cylinder), for example when single firing a Harley-Davidson motorcycle. The VS-1 coils can be used on one, two, three, four, six and 8 cylinder engines. One coil per cylinder is required. The coil pack features an integrated electronic switch allowing the coil to be directly hooked to the battery bypassing old wiring and potentially troublesome connectors, ignition switches, kill switches etc. This allows for full current to the coil while preventing current drain when not in use. One coil per cylinder is required. Coil uses one 90° plug boot. The VS-4 Quad Pack is a two core coil pack with four outputs that can be easily daisy chained (multiple coils can be wired to fire off the same control signal). It has two independent two output coils. It is typically used to waste spark 4 or 8 cylinder engines with 180 degree opposing cylinders. One coil pack is required for a 4 cylinder engine and two packs for an 8 cylinder engine. The coil pack features an integrated electronic switch allowing the coil to be directly hooked to the battery bypassing old wiring and potentially troublesome connectors, ignition switches, kill switches etc. This allows for full current to the coil while preventing current drain when not in use. Coil pack uses four 90° plug boots. The VS-6 Six pack is is a three core coil pack with six outputs used to waste spark six cylinder engines with 180 degree opposing cylinders. It has three independent two output coils. The coil pack can be easily daisy chained (multiple coils can be wired to fire off the same control signal). 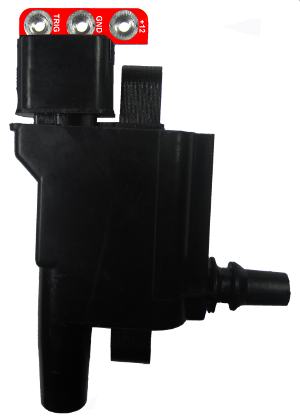 The coil pack features an integrated electronic switch allowing the coil to be directly hooked to the battery bypassing old wiring and potentially troublesome connectors, ignition switches, kill switches etc. This allows for full current to the coil while preventing current drain when not in use. Coil pack uses six 90° plug boots. The SF coil pack is used when single firing a Harley-Davidson or for other two cylinder engines that do not have 180 degree opposed cylinders. Coil pack uses two straight coil boots. Power adapter for SF coil is sold seperately. Can be used to drive up to two 3 ohm primary coils. Power Arc Ignition wires are designed to be physically tough, resist high temperatures and provide excellent noise suppression. Spiral core ignition wires with 90° plug boots designed to work with Power Arc ignition modules. Includes two boots either 90° plug boots or straight coil boots and brass crimp connectors. We can custom cut wires to fit your application at no additional charge if you contact Power Arc or note the desired length or application in the shopping cart when purchasing. Power Arc Ignition wires are designed to be physically tough, resist high temperatures and provide excellent noise suppression. Spiral core ignition wire with straight plug boot designed to work with Power Arc ignition modules. Includes either 90° plug boot or straight coil boot and brass crimp connector. We can custom cut wires to fit your application at no additional charge if you contact Power Arc or note the desired length or application in the shopping cart when purchasing. The ECP (Edge Card Programmer) is used when programming IDS C, CD and CD-L Series Ignitions (Windows PC Required). Visit the web page or download the instruction manual for additional details. Optional power supply for bench programming is available. Hours are 10:00 AM through 5:00 PM CST Monday through Friday Ph. 515-964-7908. Orders may be prepaid with a cashiers check or money order. Special shipping instructions should be placed in the special instructions area of the shopping cart during check out. We will email or phone you with a reply and will confirm your order before shipping. Ground shipping within the continental U.S.A. is $8.00 per order. Free shipping for retail orders over $200.00 (Continental U.S. Ground Only). Customers outside of the United States must complete an authorization form before the order can be shipped by Power Arc Ignitions. Foreign shipments require a valid email address. If you have any questions please contact Power Arc.